Theosophy literally means "wisdom of God." The modem Theosophical movement was founded in 1875 by Helena P. Blavatsky. The wisdom of God, according to Theosophists, is to be found in all religions: "What we desire to prove is, that underlying every once popular religion was the same ancient wisdom-doctrine, one and identical, professed and practiced by the initiates of every country who alone were aware of its existence and importance. To ascertain its origin and the precise way in which it was matured is now beyond human possibility" (A. P. Sinnett, The Purpose of Theosophy, Boston, 1888, p. 25). 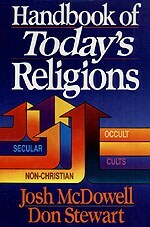 Since there is truth in all religions, a Theosophist may pursue any religion he desires. This, however, did not stop Mrs. Blavatsky from detesting organized Christianity: "The name has been used in a manner so intolerant and dogmatic, especially in our day, that Christianity is now the religion of arrogance, par excellence, a stepping-stone for ambition, a sinecure for wealth, sham, and power; a convenient screen for hypocrisy" (H. P. Blavatsky, Studies in Occultism, Theosophical University Press, n.d., p. 13 8). There are no sacred books in Theosophy. Revelation comes from "adepts", who are "beings perfected spiritually, intellectually, and physically, the flower of human and all evolution!' (The Theosophical Movement, p. 112). Mrs. Blavatsky was the first individual in Theosophy who received messages from these adepts and passed them on to the world. A few sample quotations from Theosophical writings demonstrate their non-Christian character. "We reject the idea of a personal ... God" (H. P. Blavatsky, Key to Theosophy, Point Loma, California, Aryan Theosophical Press, 1913). "We believe in a universal divine principle, the root of all, from which all proceeds, and within which all shall be absorbed at the end of the great cycle of being" (ibid., p. 63). The rejection of a personal God is a rejection of the God of the Bible, the infinite-personal creator. Theosophy has no room for a God who has created man in His personal image: "Then God said, let us make man in Our image to Our likeness. . ." (Genesis 1:26 NASB). Theosophists teach that man consists of seven parts: 1. The body; 2. Vitality; 3. Astral body; 4. Animal soul; 5. Human soul; 6. Spiritual soul; and 7. Spirit. "Man is also equated with God, ". . . for you are God, and you will only what God wills; but you must dig deep down into yourself to find the God within you and listen to His voice which is your voice" (Krishnamurti, At the Feet of the Master, p. 10). Man is evolving individually and corporately. Salvation is achieved when mads seventh stage is attained involving progressing from one body to another based upon his own self-effort. This is similar to the eastern doctrine of the law of Karma. There is nothing in Scripture to suggest that man has a seven-Part constitution. Rather he consists of body, soul and spirit, "Now may the God of peace Himself sanctify you entirely; and may your spirit and soul and body be preserved complete, without blame at the coming of our Lord Jesus Christ" (I Thessalonians 5:23 NASB). .for Christ - - - the true esoteric saviour - - - is no man but the DIVINE PRINCIPLE in every human being" (H. P. Blavatsky, Studies in Occultism, Theosophical University Press, n.d., p. 134). Mrs. Blavatsky, sounding like Christian Science, attempts to separate Christ from the person Jesus. However, Christ is merely his title, meaning "anointed one" or "messiah;' designating the office Jesus held. There is no justification for making any distinction between Jesus and "The Christ." Furthermore, making Christ a principle rather than a true man is a denial of the whole purpose of His coming: "And the word became flesh and dwelt amongst us" (John 1:14 KJVJ. "No one is to blame except ourselves for our birth conditions, our character, our opportunities, our abilities, for all these things are due to the working out of forces we have set going either in this life or in former lives. . ' " (Irving S. Cooper, Theosophy Simplified, p. 55). The idea of reincarnation, that people must go through a series of lives to atone for their sins, is a denial of the work of Christ accomplished on the cross. Salvation has been made complete by Christ's sacrifice. There is nothing any of us can do to add or subtract from it. Consequently, there is no need for a series of births to accomplish what Christ has already completed. There is no heaven or hell as such in Theosophy. The Theosophist can reach a state of "nirvana" in which the individual is absorbed by the impersonal world, losing all personal consciousness. The Bible teaches that there is an existence after death for everyone. Those who have put their trust in Jesus Christ will forever reside in God's presence while those who reject Christ will spend eternity apart from him. John's gospel makes this plain: "He who believes in the Son has eternal life; but he who does not obey the Son shall not see Life, but the wrath of God abides on him" (John 3:36 NASB). "I confined myself to the Hindu Scriptures, and in all cases I stated that I regarded these scriptures and the Hindu religion as the origin of all scriptures and all religions" (Annie Besant, The Daily Chronicle, April 9, 1894). This statement totally denies the basic premise of the Christian faith, namely, that God has given the world a unique revelation concerning who He is and who we are (Hebrews 1:1-3). The Bible cannot be God's inspired word if its origin is found in Hinduism. When Theosophy beliefs are examined, we discover the whole Theosophical system is contrary to Christianity. There is, therefore, no possibility of reconciliation between the two, since the followers of Theosophy extol Buddhist and Brahmanic theories, and Christians follow Jesus Christ alone. Theosophy- Literally means "wisdom of God." Theosophy is a cult founded by Helena Blavatsky in 1875 and which attempts to expound on the wisdom of God found in all religions. Occultic practices are used within the group. Adept -In Theosophy, a being from the spirit world who communicates revelations. Also known as Bodhisattva or Mahatma. Animal Soul-The fourth principle of human nature, according to Theosophy. The majority of people alive today are at this level. Atlantean -According to Theosophy, it is the second of three levels thus far reached in human evolution. Besant, Annie-British woman who was a highly influential leader in Theosophy as a successor to founder Helena Blavatsky. In 1906 she publicly announced to the world the coming of the Messiah, Krishnamurti, whom she reared as a child. Krishnamurti later renounced his role. Blavatsky, Helena Petrovna - (1831-1891). Founder of Theosophy. Incorporated occultic and eastern beliefs and practices together. Devas -Persons who, according to Theosophy, have been freed from their bodily prisons and are now in the world of the mind. H.P.B. -Common designation in Theosophy for founder Helena P. Blavatsky. Koot Hoomi-In Theosophy, one of the adepts who gave revelations to founder Madame Blavatsky. Kidshnamurti- Supposed Messiah figure in Theosophy who later renounced his role. Leadbeater, C. W -Along with Annie Besant, succeeded Helena Blavatsky in directing the Theosophical movement. Mahatma -In Theosophy, an adept, a being from the spirit world who communicates through spiritually receptive living persons. and it is Copyright � 1983 by Josh McDowell. All Rights Reserved. Modifications can not be made to this material without the express written permission of the rights holder.